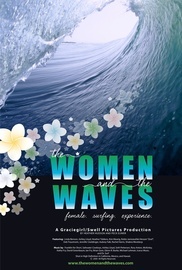 THE WOMEN AND THE WAVES is a documentary surf film that explores the lives of female surfers who, through the decades, have chosen to paddle head first into the male dominated sport of surfing and found a place of their own. Surfer girls, women who surf, women who don’t, female athletes, and the men who love them gain insight into what it’s like to “Surf like a Girl!” This inspiring film, featuring generations of women surfers, reveals what has transcended surfing’s status as a sport to become a passion so strong; it is the dominant force in their lives. Official Selections; Santa Barbara International Film Festival, San Luis Obispo International Film Festival, Santa Cruz Film Festival, Maui Film Festival, Spot X Surf Fest, Ventura Film Festival, New York Surf Film Festival, Bend Film Festival, Taos Mountain Film, La Femme Film Festival, Wild and Scenic Environmental Film Festival, The Surf Show Waveriders Festival, Taranaki Surf Film Premieres,Tynemouth Surf Film Festival, Montezuma Film Festival, Flagstaff Mountain Film, Honolulu Surf Film Fest & San Diego Surf Film Festival.